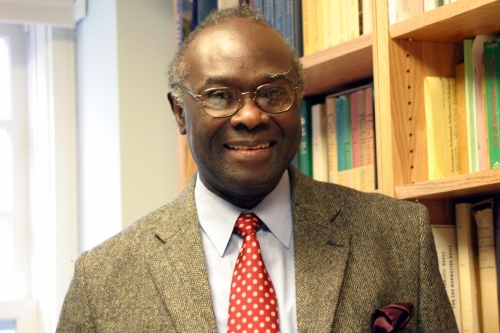 A new research institute for the advanced study of religion and society in Africa has been named for Lamin Sanneh, D. Willis James Professor of Missions and World Christianity at Yale Divinity School, Professor of History at Yale University, and Director of the Project on Religious Freedom and Society in Africa at the Whitney and Betty MacMillan Center for International and Area Studies at Yale. The Sanneh Institute will be headquartered at the University of Ghana, Legon, in Accra. The institute is in recognition of Professor Sanneh’s distinguished contribution to scholarship on the relationship of Islam and Christianity in Africa. Professor Sanneh taught at the University of Ghana from 1975 to 1978. “The Department for the Study of Religions, University of Ghana, Legon attaches great importance to the Sanneh Institute for two reasons: first, the prospect of honoring Professor Lamin Sanneh and celebrating his association with the department in a permanent way; and second, the opportunities it would offer faculty and students to interact with a wider range of international scholars toward the production of knowledge in the pursuit of peaceful coexistence of believers of different religions, especially, Christianity and Islam in West Africa,” said Alhaji Mumuni Sulemana, Head of Department for the Study of Religions, University of Ghana, Legon. The Sanneh Institute will be intentionally multi-faith and multi-disciplinary in its work. The main focus of the new institute will be to design research projects on various topics on religion and society in Africa, commission interfaith and inter-disciplinary teams of younger scholars to conduct the research, convene national, regional and international seminars/conferences to share findings, and to publish such findings for wider access. It will resource Christian and Islamic institutions in the sub-region to develop graduate programs for the study of Islam and Christianity, curricula that stimulate intellectual and theological curiosity in the other and mentor younger scholars through its research projects. In all of this, the Institute will work closely with the Department for the Study of Religions of the University of Ghana, Legon. A feasibility study is underway with funding from the John Templeton Foundation and the Blankemeyer Foundation to identify the best set of topical foci for research by the Sanneh Institute. The study, titled “Engaging the Mosque and the Church in West Africa,” is led by Dr. John Azumah, Professor of World Christianity and Islam at Columbia Theological Seminary, Decatur, Georgia, in partnership with ScholarLeaders International based in Chicago, Illinois. The main aim of the feasibility project is to examine the state and nature of the advanced study of Islam and Christianity in West Africa and their intersections. The study will review academic programs in West African institutions and universities dedicated to religious studies in order to determine how much of the work being done is related to Islam and its interface with other African realities. The goal will be to ascertain the level of mutual theological and spiritual curiosity in the advanced study of Islam and Christianity in West Africa. In December 2018, advisers of the initiative will meet at a conference convened in Accra, along with a select group of religious leaders and academics from across West Africa, to assess the findings from the feasibility study and to design a plan for the institute based on them. Professor Sanneh and Dr. Mustapha Abdul Hamid, Ghana’s Minister of Information and spokesperson for the President of the Republic of Ghana, will present keynote addresses on “The Church, the Mosque, and the Academy.” As founding director of The Sanneh Institute, Professor Azumah will relocate to Ghana in June 2019. The Sanneh Institute will be formally inaugurated in early 2020.